With its elegant and comfortable plastic seat, the chair offers great seating comfort. And this in both indoor and outdoor areas. It is therefore suitable for use on the terrace or in the garden. The special additives in the plastic tray slow the fading in the sun and the undercarriage is also weather-resistant due to the powder coating. If large quantities are used, eg. In chic cafés, the chair can be stacked in a space-saving way. Up to 5 chairs can be stowed together. The Tom Vac chair is available in various designs. The stackable four-legged steel tube support is optionally available in bright chrome or light silver (smooth powder coated), the powder-coated version also being suitable for outdoor use. In addition, the frame is galvanized. 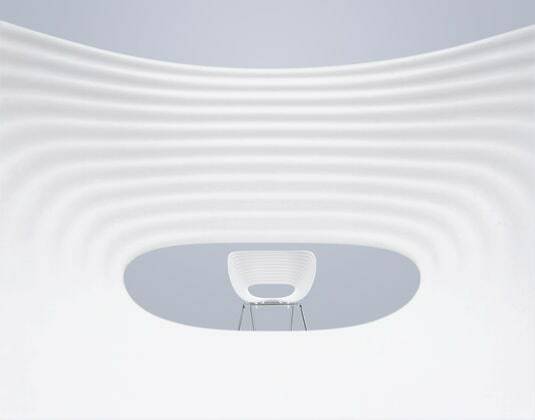 The seat shell is available in white or basic dark, has a wave structure and consists of dyed polypropylene. Sliders are selectable for carpet or hard floors (felt pads). In 1999, he designed the Tom Vac chair from Vitra. Born in Tel Aviv in 1951, Ron Arad studied at the Bezalel Academy of Art and Design in Jerusalem, and later in the Architectural Association in London. He opened his own design office in London in 1981 and began producing unconventional, welded furniture, which was highly sculptural. Together with Alison Brooks, he founded "Ron Arad Associates Ltd.". He has designed furniture and objects for serial production since the end of the 80s. He founded the "ron arad studio" in Como in 1994 and was a guest professor at the Technical University of Vienna. Until 2009, he was Professor of Industrial and Furniture Design at the Royal College of Art in London. The first design museum in Israel, the design museum Holon in Cholon, was opened in 2010, planned by Arad and Bruno Asa. Vitra is a world-wide company. The Headquarter is located in Switzerland, in the city of Birsfelden near Basel. Since its founding in 1950, the company has been family-owned. Production sites are located in Germany (Wheil am Rhein, Neuenburg, Mülheim a.d.R. ), the USA, Japan and Hungary. The manufacturer relies on the power of design to improve the quality of living spaces, public facilities and offices in a sustainable manner. In intensive design processes, new products and concepts are constantly being developed at the headquarters in Switzerland. This creates inspiring and functional furnishing concepts, furniture and accessories. The most important principle is the longevity of material, aesthetics and construction. This is reflected in the classics of the company that have been manufactured since the 1950s. Base: Stackable four-legged steel tube support, chromium-plated or powder-coated in accordance with RAL 9006 (silver color). 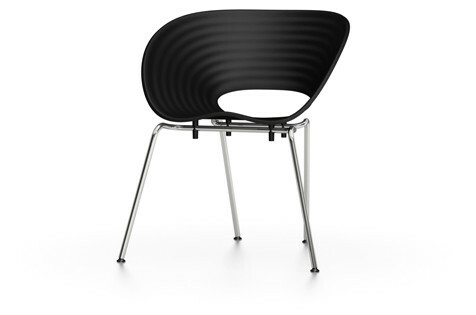 Related links to "Vitra Tom Vac chair"
Customer evaluation for "Vitra Tom Vac chair"